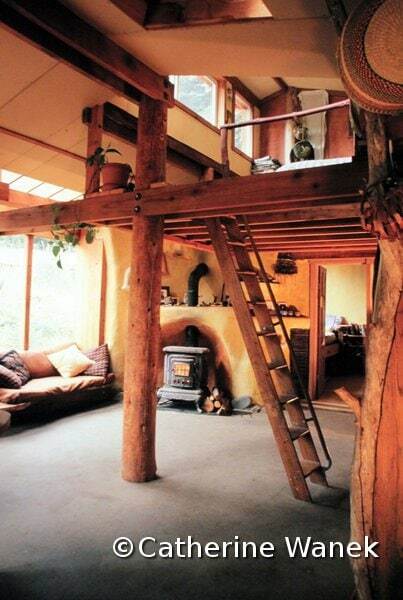 A hybrid natural home at Emerald Earth. Note the winter sun shining through south-facing windows onto the earthen floor and clay-plastered walls. In any temperate climate, you can reduce or even eliminate the energy needed to heat and cool your home by careful siting and design. 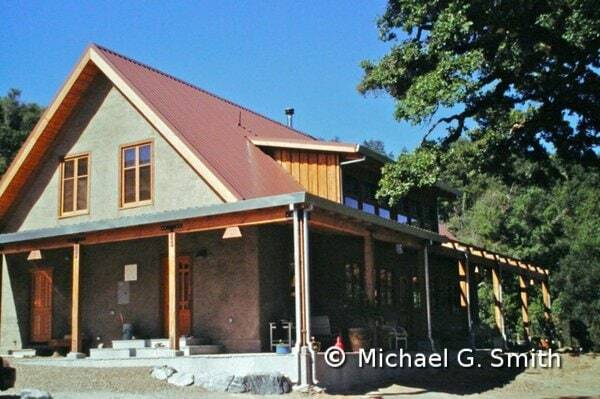 Passive solar homes work best when built from a combination of high-mass materials such as cob or stone and insulating materials like straw bale or straw clay. You also need to orient the building correctly (ideally with a long side facing south), place most of your windows on the south side and very few on the north, and calculate the ideal roof overhang for winter sun penetration and summer shading. Here’s how it works: rays from the low-angle winter sun shine into the house through south-facing windows and are absorbed by high-density material on the floors and wall surfaces that the sun hits. When the air temperature falls at night, this stored energy emerges to heat you and the interior of the building. Good insulation in the building envelope (especially the roof and north-facing walls) is essential to keep the heat inside the house. In the summer, when the sun angle is higher, roof eaves shade the windows from the sun. On a hot day, you shut the house up tight in the morning, and the thermal mass will cool the building during the day by sucking heat out of the air. At night, open the windows to let cool air run through the house and flush out the heat. Wrap-around porches shade the south and west walls of this straw bale home in summer. Notice also the huge oak tree to the southwest of the building. Solar heating will only work if the sun shines on your home in the wintertime. This can sometimes be challenging in urban, forested, or mountainous locations, and also where winters are cloudy for long periods. In these situations we use less direct passive heating strategies and also rely on a supplemental heat source such as a wood stove. Site features such as shade trees and cooling breezes should also be taken into consideration for passive cooling.